Jung Young Moon’s A Contrived World (translated by Jeffrey Karvonen & Mah Eunji, electronic review copy courtesy of the publisher) is another of the writer’s semi-autobiographical books about nothing in particular, revolving around two trips he made to the west coast of the USA. During the first, he spends time with his ex-girlfriend and her new Mexican boyfriend, chilling out in the desert (if that’s possible…). The second, years later, then sees him on an extended visit to San Francisco, waiting for inspiration for a novel to strike in the midst of his random rambles. The novel is divided into chapters in which Jung uses the world around him as material for his writing. In parts, it’s fairly descriptive, a picture of San Fran and the surrounding region, with Jung acting as a tour guide for his readers. However, these passages are often simply springboards for the writer’s imagination, with Jung taking the reader off on tangents, which (as usual) leave us wondering whether there’s actually a book here at all. She was clearly not having the kind of conversations we used to have with her Mexican boyfriend. It occurred to me again that she’d changed considerably, and that I hadn’t changed much at all. After all those years, I still thought mainly about nonsense, and I usually talked nonsense when I met people. Jung’s previous work in English, Vaseline Buddha, did mention the outside world, but for the most part was a rather abstract work. By contrast, the setting is an important part of A Contrived World, with the writer’s musings inspired by the places he visits, from the desert to forests and the city. Surprisingly, there are times when he plays with a surprisingly straight bat, and some of the descriptions could come straight from travel books – there’s something very Brysonesque about the way he introduces the Californian coastline. As in Vaseline Buddha, Jung experiences frequent bouts of dizziness and ennui, often unable to rouse himself from his sombre moods, and the fog he encounters here is akin to a physical manifestation of these moods. This darker side to his writing is ever-present, and the description of his temporary home as one of the world’s suicide capitals is no coincidence. It’s never easy trying to pull themes together in Jung’s work (like threading fog…), but there’s a definite sense of movement and drifting running throughout the book. The writer has an obsession with hoboes, vagrants and drifters (and has detailed theories on the differences between them), detailing his encounters with the homeless people in the park and delighting in telling their stories along with his own. These are people who need to keep moving, with no real attachment to their home, and the reader senses that the writer feels an affinity with them. While some readers may tire of his constant twists and turns, A Contrived World can be a delight to read. 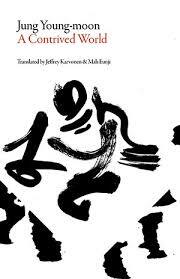 The translation reads nicely, and once you settle into the novel, the usual contradictions and jokes are entertaining. I do wonder, though, whether the translation is a little too smooth. Jung’s other works in English have seemed less watered down, and in this one, the sentences appear to be shorter, with more standard vocabulary choices. Interestingly enough, Jung Yewon (who translated Vaseline Buddha and some of the stories in the collection A Most Ambiguous Sunday) produced a sample translation from A Contrived World back in 2013, and there are clear differences between the two versions. I’m not going to judge whether her version of the text is better or worse than that of Karvonen and Mah, but it’s certainly different. Nice review. Not quite sure whether to get to this one – Vaseline Buddha was a bit too random for my taste. Could you give an example sentence or teo comoaring the two translations? Ah thanks – hadn’t realised that. Now we need the Korean original and someone to opine on which is the closest! I am a big Jung Yewon fan, but her translations do have quite a distinctive style. And to be contrarian I rather like the covers! But I am the exception that proves the rule, since book covers aren’t something that interest me generally so utilitarian and uniform is more to my taste than creative and expressive. Paul – I always thought I was someone who didn’t really care, but I do appreciate it when it looks like someone actually made an effort, which is certainly not the case here (and that really rings true for a lot of aspects of this series…). Sveta – Well, I think I’m still one short, and while I did get ARCs of the first fifteen, sadly, all the books after that are ecopies only (which doesn’t really make me feel like rushing through them all…).